The style I was going for was that of a complete novice, who has never done any web design before. Mission accomplished I feel! Any comments however scathing will be appreciated :-) Any typos are purely intensional (see what I've done there)! Have fun with it and buy some beer. It's nice. The Aim of our Company is to make and sell Wildlife-Inspired Idiosyncratic Beers proceeds from which go towards UK based wildlife societies, charities or trusts. The Company was founded in February of 2012 by Graeme Denton and Colin Bowler, who share common a common interest in, amongst other things, wildlife, beer and horse racing. Our first range of beers was inspired from birdwatching in the beautiful county of Northumberland where waders and seabirds can be accessed easily and seen in relatively large numbers - hence we decided to develop a "Seabird Series" of beers. 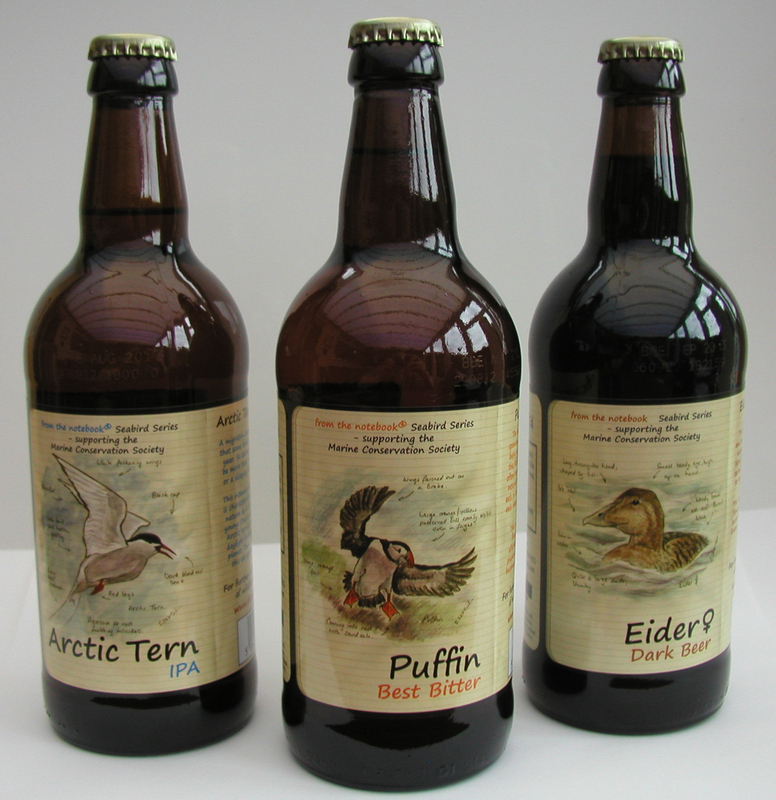 These currently include Puffin (Best Bitter), Kittiwake (Golden Ale), Arctic Tern (IPA) and Female Eider (Dark Beer). The ideas behind "from the notebook" is that the flavour and style of the beers should in some way reflect the characteristics of the birds themselves. How we have tried to achieve this is given on the bottle labels. So go ahead and buy some to find out what we've done and if you think that we have achieved our objective. Our bottle labels are very distinctive. The artwork looks like it actually has come from a notebook - because it has! These fantastic drawings were created by Stewart Sexton, a Northumbrian wildlife enthusiast. Inside the bottles, we think that we have created some nice beers too. This has been achieved in conjunction with the Allendale Brewery in Northumberland, who helped us develop these beers and have been most supportive of our ideas and brand throughout the development process. Cheers to Tom, Lucy and Neil. The first commercial batches have now been produced for 3 of the 4 beers. Kittiwake required further refinement through the development process, but I'm please to announce that it is scheduled to be brewed at the start of the week commencing 24th September 2012. All the beers are available and being distributed from Northumbrian Gifts in Ashington, Northumberland. If you wish to buy them online, visit www.northumbriangifts.co.uk Our beers are currently being sold in the "Choose Your own Ales" section, but a dedicated FTN section is currently being developed. I shall continue to post further development via this medium on a regular basis, but for now, thanks for reading and I hope you get to sample some of our Seabird Series beers soon!